Sydney is a well known tourist place and one of the most visited cities in Australia. It is well known for it’s natural beauty, spectacular waterways, awesome summer temperatures and beautiful beaches. Therefore, taking a vacation to Sydney, Australia, can be a grand adventure for you and your family. However, it’s important that you make sure you are familiar with the different Sydney attractions and how you will access them. Since most of Sydney attractions are accessible by land, it’s important to take a safe driving course if you are a long-term tourist.The instructors will take you through all the traffic rules and regulations. The driving course will help you get round the city with ease. To visit the various tourist attractions, it is advisable to hire a car because it is cost effective to travel around by road. To hire a car, you need to familiarize yourself with the rules that surround the car rental industry. Once you enroll for a safe driving course, you will be taken through requirements which you must have. For instance, you will be required to have a valid driver’s license, a passport for ID and a credit card which will act as a form of security. The safe driving course will give a guide to Australia road rules. This will make your driving holiday in Sydney Australia more enjoyable. Some of the some essential rules and regulations are for example you must have a valid international driving permit which must be accompanied by a driving license issued in your mother country. Secondly, you will learn the side of the road that Australians drive on. Thirdly, you will get to know that it is illegal not to wear a seat belt for all drivers. In addition, the traffic rules also require that children below 7 years must be under a child restraint .Speed limits are strictly enforced in Australia. Drivers must observe the speed limit especially around school zones and residential areas. Violation of these rules comes with a heavy penalty. The course makes sure that it leaves you a better driver on roads. Instructors will give practical lessons that are highly beneficial. They will teach you how to handle cars at difficult situations the best way. In addition, you will be taught how to watch wildlife on the roads and how to maintain a safe traveling speed. Once the hired vehicle breaks down, you will be shown how to follow company instructions as you wait for road assistance. Hiring a car will help you have fun and adventure as you enjoy attractions that Sydney has to offer. Sydney has something on offer for everyone ranging from sun-soaked beaches and museums to exotic restaurants and incredible monuments. It is a popular destination for lots of international travelers and for good reason. With a mild and friendly climate all year round, Sydney offers a tremendous vacation experience to everyone. There are several must see places in Sydney. Considered the tallest structure in the city, Sydney Tower is located at the corner of Pitt Street and Market Street. Having the same height as the world renowned Eiffel Tower in Paris, Sydney Tower offers stunning views of one of the most amazing cities in the world. Well known as one of the most popular landmarks in the city, Sydney Harbour Bridge crosses the Harbour and offers spectacular views of the city and harbour, especially in the early hours of the morning and at sun set. Riding or walking along the bridge offers promises to be remarkable. The western part of the bridge is reserved for cycling and the eastern part for pedestrians. Visitors can climb to the top of the Bridge via the Pylon Lookout or BridgeClimb. Located on the city’s harbour front, Sydney Opera House is proclaimed a World Heritage site by UNESCO. This world renowned iconic building features impressive architectural works of the 20th century. Renowned for being a world-class performing arts centre, the Sydney Opera House stands as a symbol of both Sydney and Australia as a country. Located at Darling Harbour, the Sydney Aquarium is one of the most visited tourist attractions in Sydney. It also has a reputation of being the largest aquarium on the face of the planet. Exhibits at this lovely sites takes tourists on a roller coaster ride to the rich and diverse waterways and marine ecosystem on the continent. One of the attractions here is the Open Ocean featuring underwater tunnels. A tour of this place allows guests to catch a glimpse of the country’s popular marine life at a very close range. Sydney Aquarium is home to the largest collection of sharks. 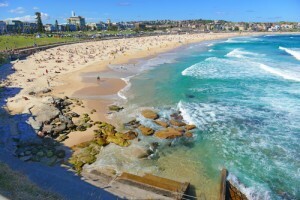 Bondi Beach is the most visited beach with the closest proximity to the city. Visitors can catch a regular bus from the city to the beach. Bondi Beach is one of the most beautiful places to visit. It is also a perfect place to relax, unwind and enjoy great water sports activities such as surfing and swimming. Whenever you are in Sydney, make sure you don’t miss any of these top attractions listed above. Don’t forget to visit us at Car Hire Nation to book your cheap car rental too!